Spider-Man: Homecoming is mere days away from finally swinging into theaters. Those of us who have been waiting for a great Spider-Man movie (and it has been a long wait) are hoping this is finally going to be it. By all early accounts, it very much is. Now you can get the first taste of that alleged greatness as the first four minutes of Spider-Man: Homecoming have been released online. The Spider-Man: Homecoming clip, which comes to us via the First Trailer YouTube channel, is one of the last things that can possibly convince you to go see the movie, if the trailers haven't done that for you already. In the clip, we see Peter Parker making a video documentary on his phone during his adventure with Tony Stark, as the events of Captain America: Civil War unfold. He is riding around with Happy Hogan (Jon Favreau), who is shepherding Parker and showing him the ropes. We also get to see him trying on the upgraded Tony Stark suit for the first time. This all leads to the conversation in the backseat of Tony's car that has been teased in the trailers quite a bit. We get a great sense of Tom Holland's Spider-Man in this clip, all from a POV/found footage angle, which is something new. Considering there have been five live-action Spider-Man movies up to this point, new is good. We also get a slightly better sense of what Peter Parker and Tony Stark's relationship is going to be in the movie. Even though Iron Man is going to feature in Spider-Man: Homecoming, this clip makes it even more clear that this is very much a Spider-Man movie and not just Iron Man 4 featuring Peter Parker. As much as seeing the two interact with one another is great, that would be a pretty big let down. It is all thanks to a landmark deal between Sony and Marvel Studios that Spider-Man: Homecoming, which arrives in theaters on July 7, was even possible. 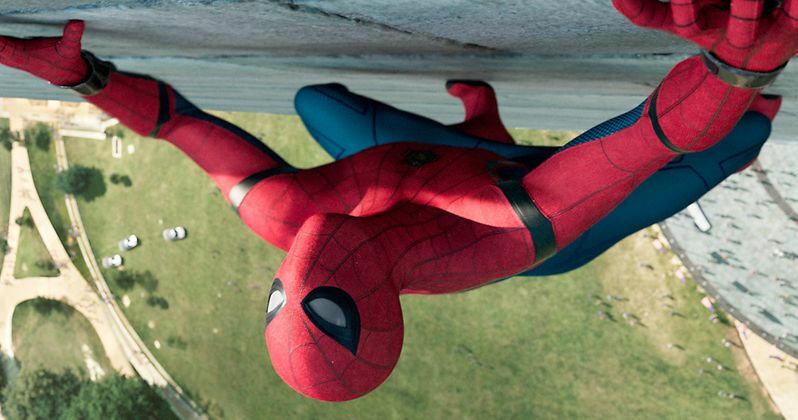 Fans have been begging to see Spidey in the Marvel Cinematic Universe for a very long time and, following his debut in Captain America: Civil War, this movie is making that wish come true. There was fatigue with the character following The Amazing Spider-Man 2, but it looks like this movie is going to cleanse our palettes. As of this writing, Spider-Man: Homecoming has a 93 percent approval rating on Rotten Tomatoes, making it the highest-rated entry since Spider-Man 2 in 2004. Spider-Man: Homecoming is currently tracking for an opening weekend north of $100 million domestically, which should make this deal between Marvel Studios and Sony worthwhile for both parties. So get used to Tom Holland's Spider-Man because we're going to be seeing a lot of him in the future. For now, you can check out the Spider-Man: Homecoming clip for yourself below before checking out the movie this weekend.